As a kid growing up on a farm I spent many summer days watching, and eventually helping, my dad and the neighbors with some of the most grueling work that was required on the farm. And of course most of the time this work had to be done on some of the hottest days of the year in the Midwest. But when it came time for a break to cool off and re-energize, my grandma knew just what the farmers, and we kids, needed. For the kids it was usually a can of pop or thermos of ice water, but for the adults it was a tall glass of iced tea served from a glass pitcher with a push-button spigot on the front. It took me several years before I was able to drink the iced tea my grandma made, it wasn’t exactly a taste that a 10-year-old enjoyed. But once I got a taste for it there was no other glass of iced tea that could compare. What was my grandma’s secret? I’m sure there wasn’t one, except that no matter how many times I’ve tried I still can’t duplicate it. However, the one thing I do know is that grandma made tea the old fashioned way, using the power of the summer sun. 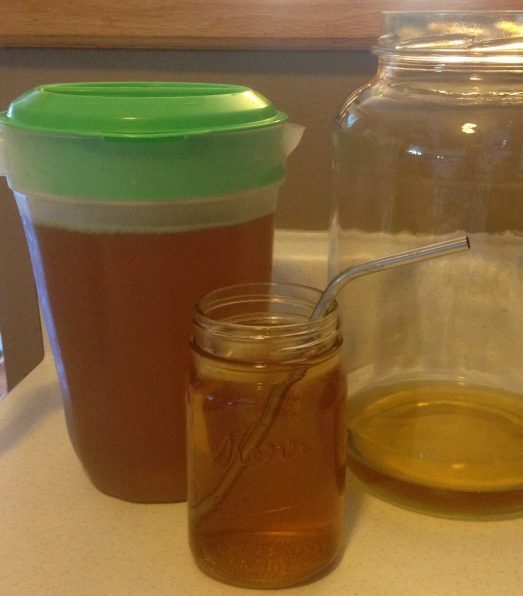 While mine will never compare to grandma’s, I still enjoy brewing a jar of sun tea during the summer. 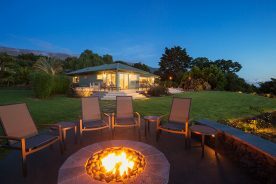 Nothing tastes better on a hot humid night than sitting on the deck, watching the fire flies and sipping a tall, cold glass of tea poured over ice. You can enjoy your own refreshing beverage by following these quick and easy steps. 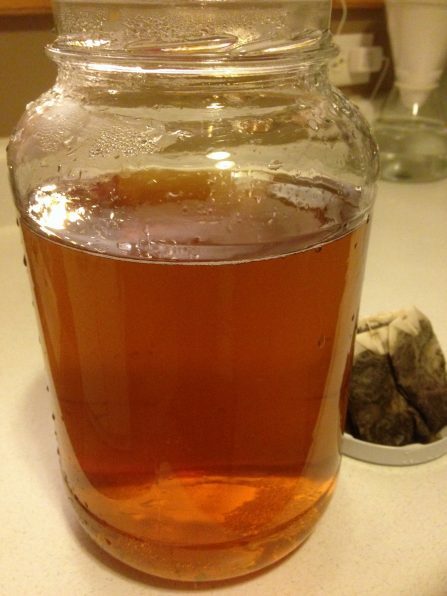 There really is no right or wrong when it comes to picking the right tea for brewing the perfect jar of sun tea. It basically comes down to your own personal taste. I know my Grandma used Lipton iced tea. And no matter how many times I buy the same brand I still can’t duplicate the flavor. That’s why I started experimenting with other flavors and brands to find something that I preferred. Black tea and green tea make excellent sun tea. It also doesn’t matter if you use tea bags or loose tea leaves that you filter yourself. You will want to make sure you get the type that requires boiling water to brew and not a cold-brewed tea. After several hours in direct sun, your tea can reach up to 130 degrees. 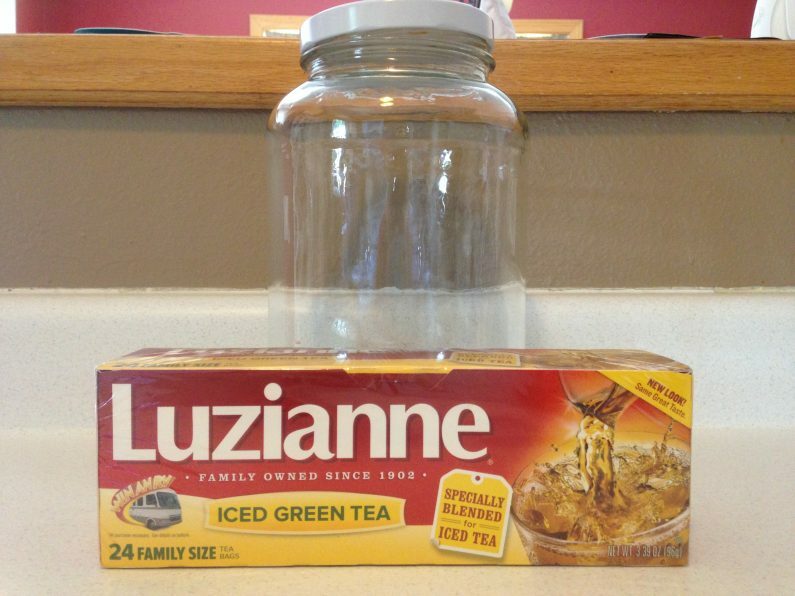 My preference right now is Luzianne Iced Green Tea. The jar you choose really depends on how much tea you want to make – a gallon, a quart, 2 quarts. I actually use a gallon-sized glass jar that my grandma gave to me. Of course it is one that she brewed sun tea in for many years herself. It is an old ?? jar that still has the metal lid that doesn’t screw on quite right anymore, but it’s the one I will use to brew tea until, heaven forbid, it breaks. Whether it’s an old pickle jar or a brand new tea jar with a spigot, you definitely want to use glass as opposed to plastic. When plastic heats it can allow chemicals to leach out into your tea, and you know that won’t taste good. 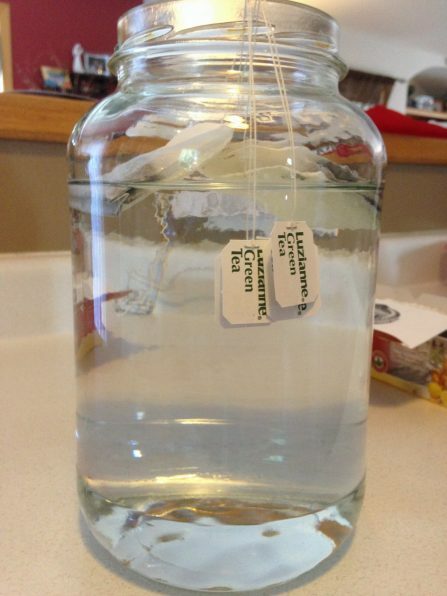 You will also want to sterilize the jar with boiling water before use to avoid bacteria growth in the tea. Avoid using harsh cleaners such as bleach or other chemicals as it can also effect the taste of the tea as it brews. When you’re ready to start simply fill your jar with cold or room temperature water. Distilled or filtered water makes the tastiest beverage. Place as many tea bags as you’ll need in the water according to the directions on the package. My preferred brand requires 1 bag per quart so I use 4 bags to make a gallon. This is the step that allows for personal preference as you can mix different types of tea bags to find your desired taste. Obviously if you are making sun tea you will want to do it on a sunny day or at the very least a minimally cloudy day. It doesn’t necessarily have to be a really hot day but the tea will brew more quickly in hotter sun. You will want to place your tea jar in a place that will have direct sunlight for the entire brewing time. 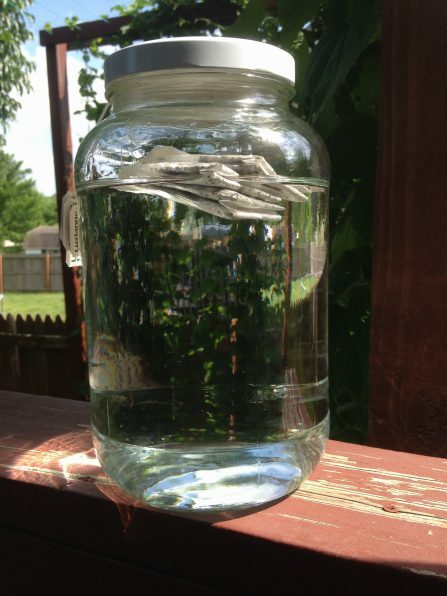 If your backyard is too shady and doesn’t allow for several hours of total sun, be prepared to move your jar. It will need approximately 3-5 hours of brewing to create a smooth, crisp taste. If you prefer strong tea, you’ll want it to steep for at least 4-5 hours. 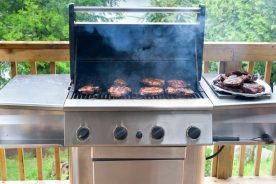 Do not leave it out for longer than 5 hours as this can lead to bacterial growth. After your jar of tea has basked in the sun for several hours, it’s time to take it in and cool it down. After removing the tea bags and discarding them, you can simply store it in the jar it was brewed in or transfer it to a pitcher or container that fits more easily in your fridge or is easier to use. My grandma typically used a jar with a lid and a spigot so she wouldn’t have to do any pouring. The jar sat on the edge of the refrigerator shelf where you could just open the spigot and fill a glass. My gallon jar is bulky and hard to pour from so I store my tea in 2 two-quart pitchers with lids and handles for easy pouring. Since the pitchers are plastic I steer away from doing the brewing in them. When the farmers would break for refreshments during the grueling farm work, Grandma always brought the entire tea jar outside along with plastic cups so her good dishes wouldn’t get broken. But when we enjoyed her tea in the house it was always served in a tall glass with blue flowers painted on the side. I’m sure they were from her and my grandpa’s original dishes they received as a wedding gift. Maybe that’s what made the tea so special! I prefer to drink my tea now out of a glass or a mason jar filled with ice and a lemon wedge. No sweetener for me, I think it takes away from the refreshing taste. 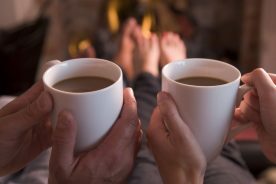 But you can enjoy yours however you wish – with or without lemon, with sugar, with artificial sweeteners, or maybe with some vodka, gin, rum, triple sec, and tequila. 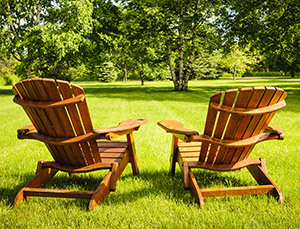 As long as it tastes good, quenches your thirst, and you can hopefully relax in the backyard while doing it.